Spring is here in the desert where I live. 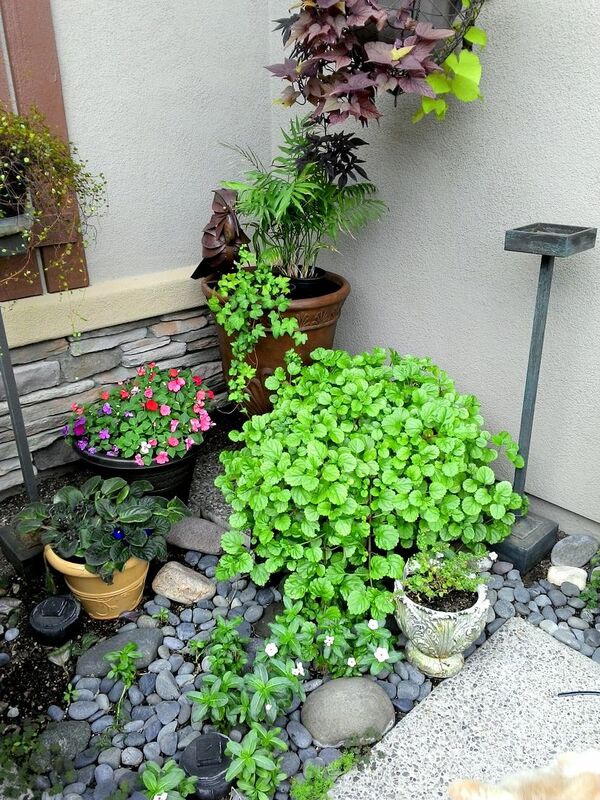 The little walled-in courtyard in the front of my house is my secret garden. Here I plant all kinds of things that you don’t normally see in the desert. With lots of water, shade, and protection from the wild animals it is a small oasis of color. 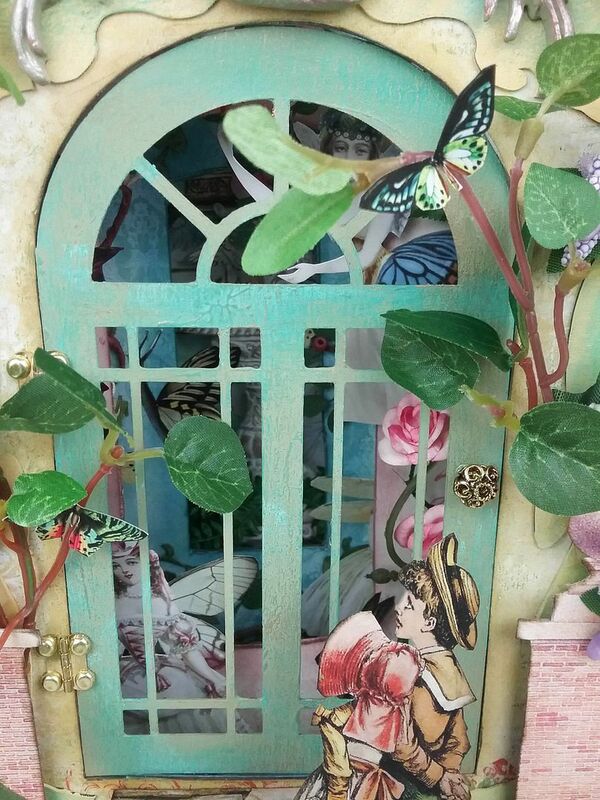 Using my own special place as the springboard for a project, I created a secret garden tunnel book. This fantasy garden is hidden away behind a door and through a tunnel of ever smaller openings. As you look through the door you’ll see images peeking out through the openings on each page. Standing on the stairs are two children, wondering whether or not to enter, while the owl peers down at them. 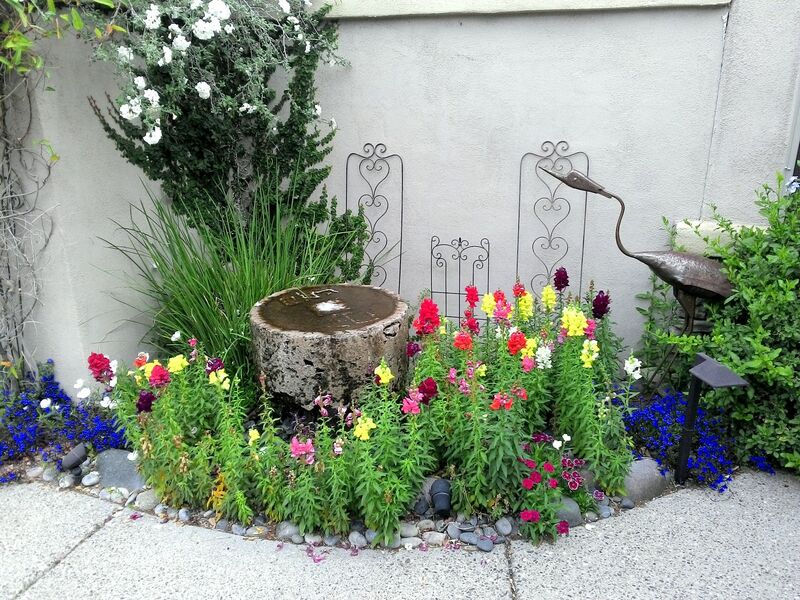 Each part of the garden is unique and filled flowers and all kinds of flying creatures. 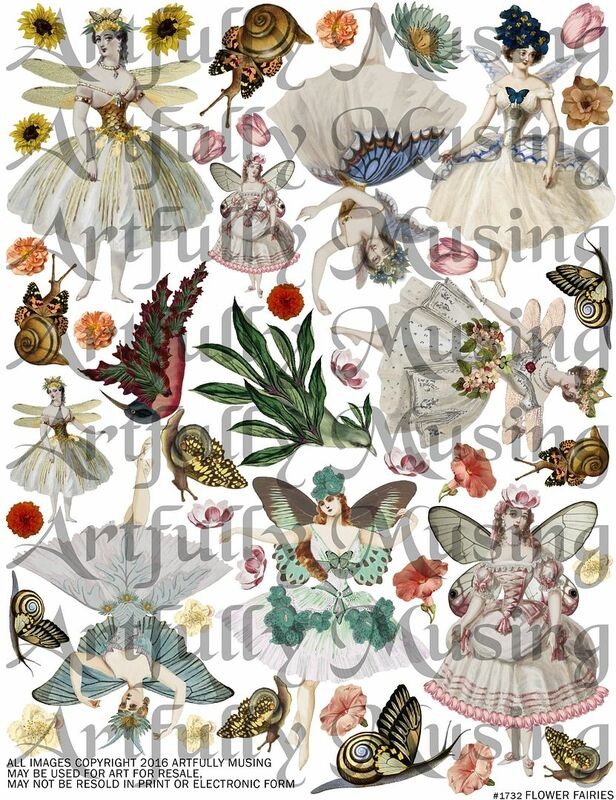 This collage sheet includes flower fairies, flying snails, fantasy winged birds, and flowers. 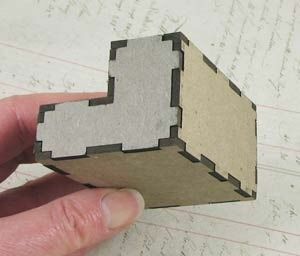 The base of the book is made from the album kit pictured below. 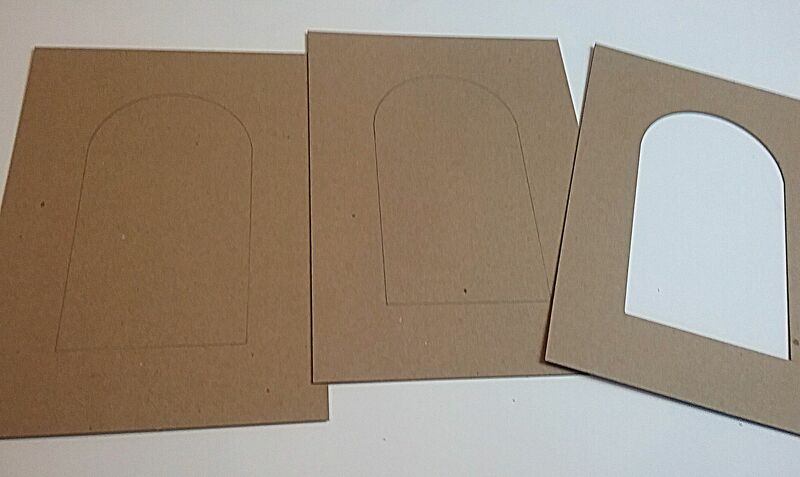 The first step is to create smaller and smaller openings in each page based on the shape of the first pre-cut page. You can do this for as many pages as you like. For this project, I have 3 pages with progressively smaller openings with a solid page for the last page. 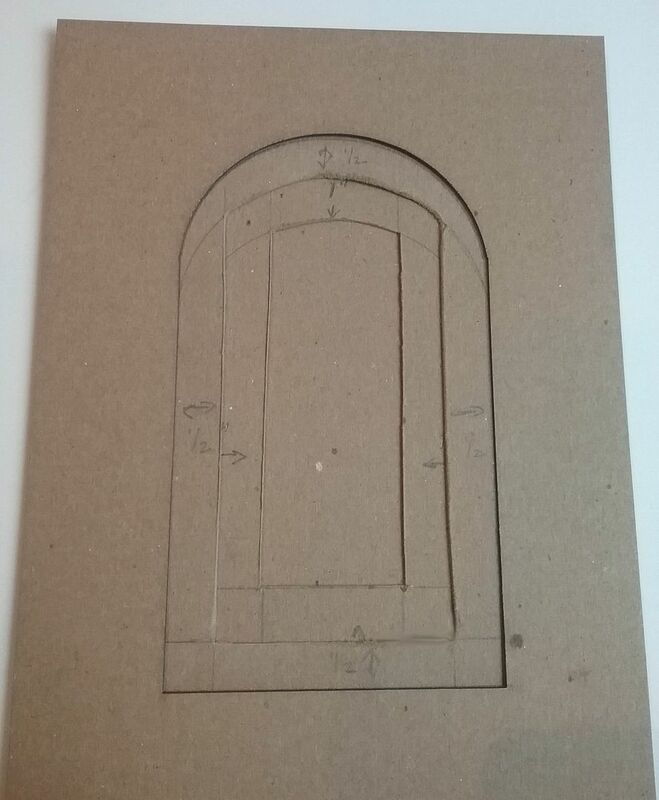 I started by tracing the door opening onto 2 of the chipboard pages. 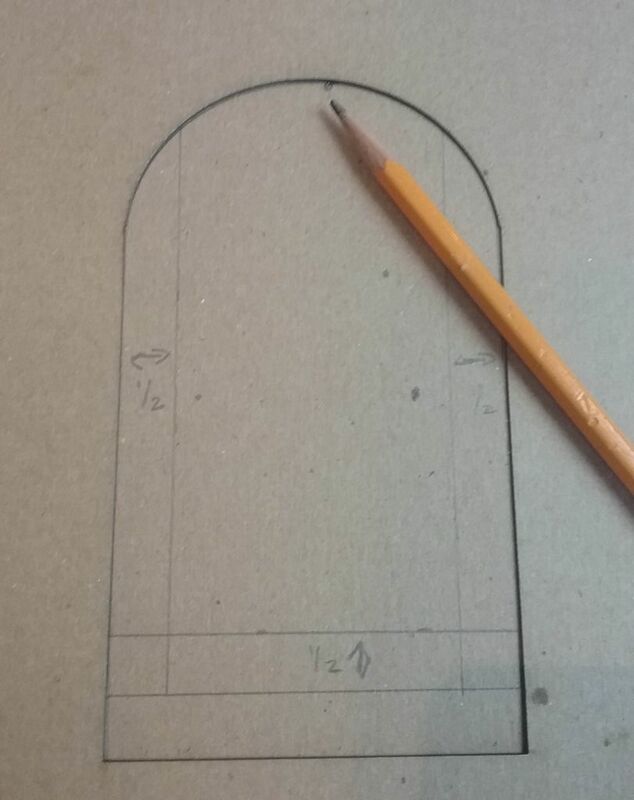 Next, on one of the pages, I measured ½ from the bottom, sides and top trace lines. 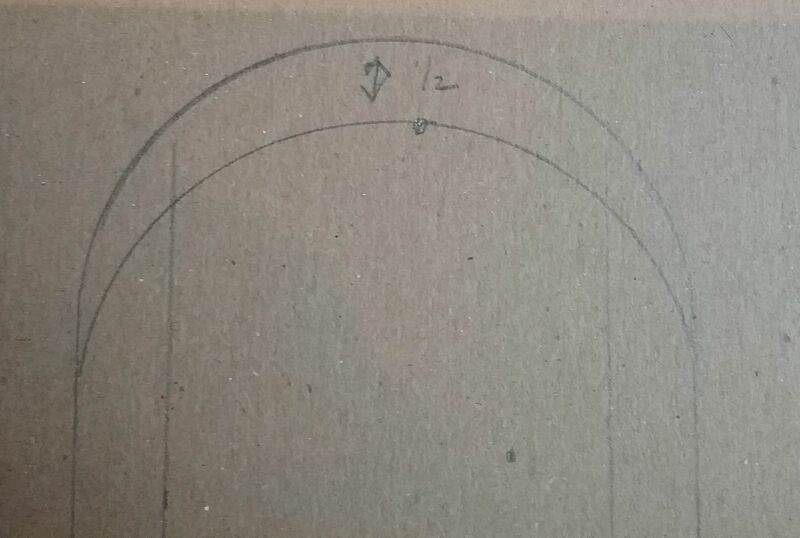 I drew a line on the sides and bottom representing ½ from the original trace line. For the top curve, I penciled in a dot. 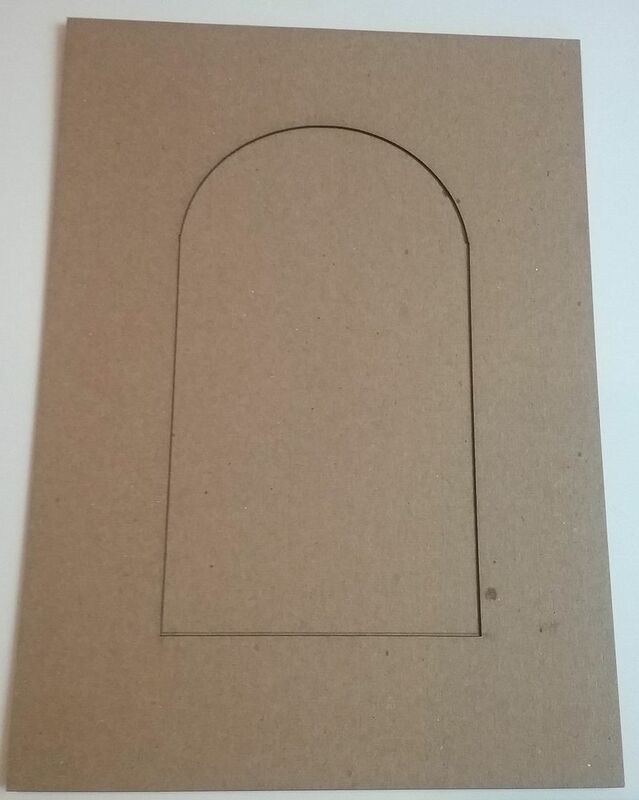 I placed the page with the arch intersecting the dot and drew a line using the arch as the guide. 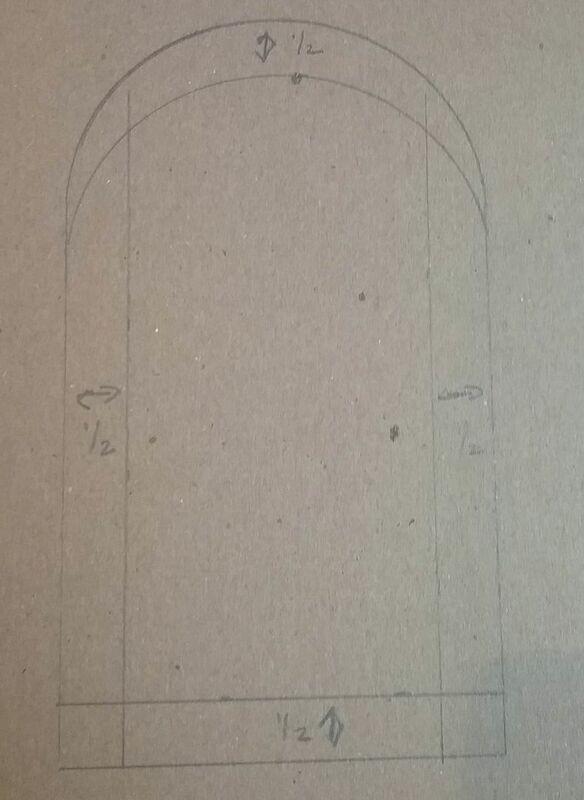 Below you see the arch drawn ½ away from the original tracing. 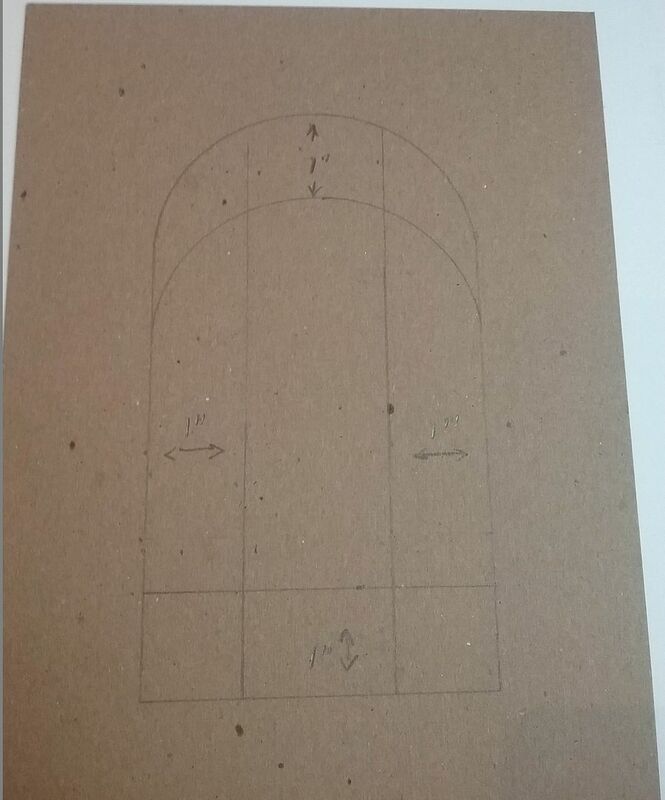 On the second chipboard page, I went through the same procedure as I did for the first accept this time the measurement is 1”. Using an X-Acto knife, I cut out the center areas of each of the pieces. In the picture below you see the original pre-cut page plus the two pages in which I cut smaller holes and then the solid page in the back for a total of 4 pages. For the spine, I used one of the pages and marked 3 lines 2” apart. 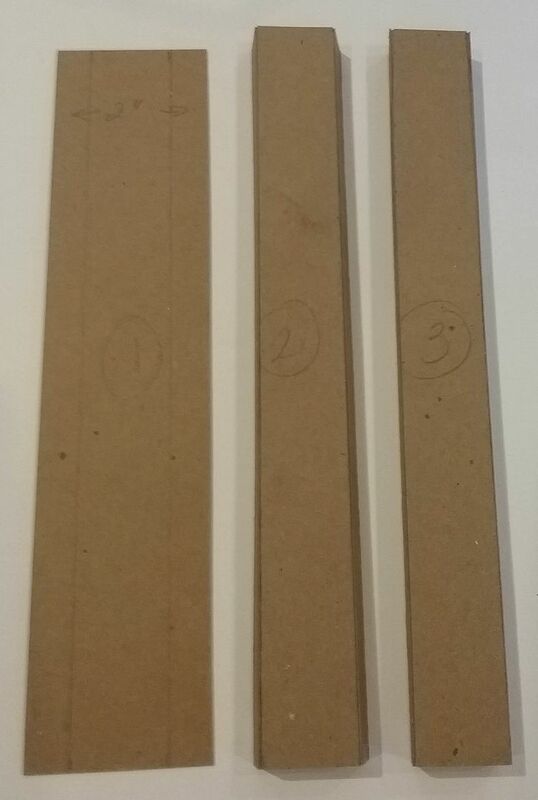 The 2” will allow for a 1” spine and two ½ “ tabs (used to attach the spines). 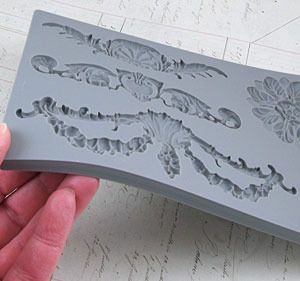 I choose 1” for the spine so that I would have room for bulky embellishments and also to help the book stand on its own. 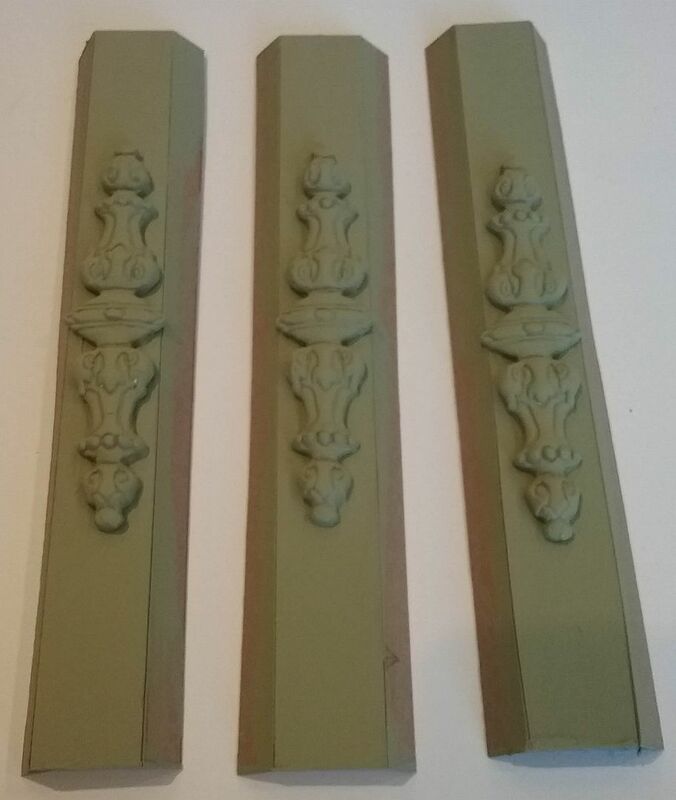 Next, using paper clay and the lovely silicone mold you see below, I made decorative pieces for the spine. 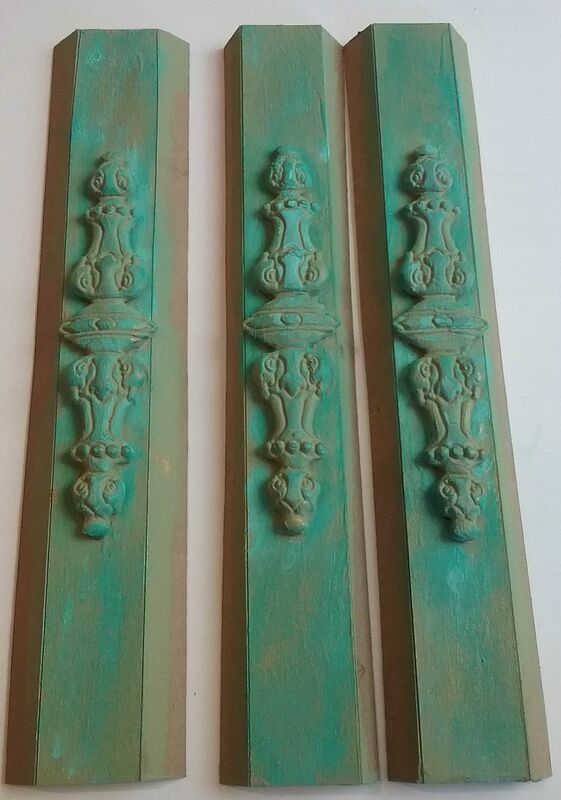 Once dry, I glued the decorative pieces to the spines and painted them with green acrylic paint. I also painted the inside creases as you might get a peek at them when the book is assembled. Next, using my finger, I rubbed on Patina Guilders paste and then Inca Gold Gilders Paste. I did this just to the outside of the spines. Note that I didn’t color all of the tabs on the inside or the outside as they will not be seen once the book is assembled. I just made sure that the outside of the spines and the creases on the folds both inside and outside had color. 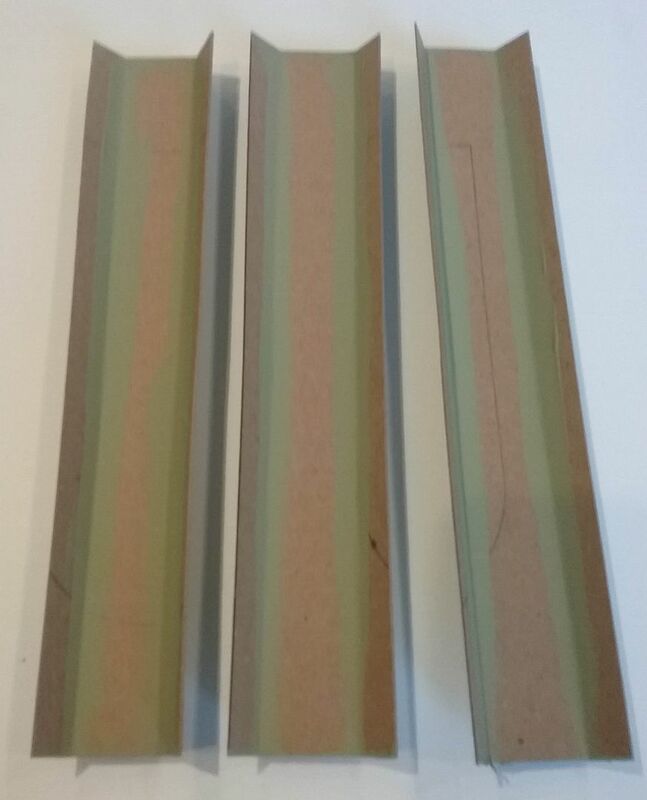 I also added a strip of decorative paper to the inside of the spine between the creases. 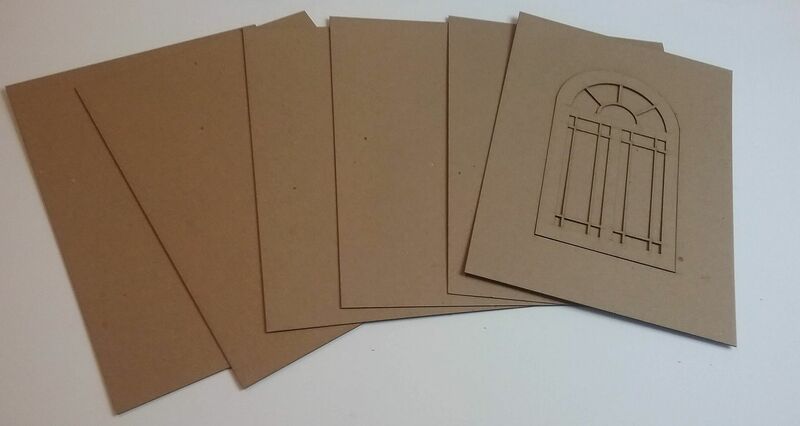 I prepped the first page of the book by covering what will be the front side with decorative paper. 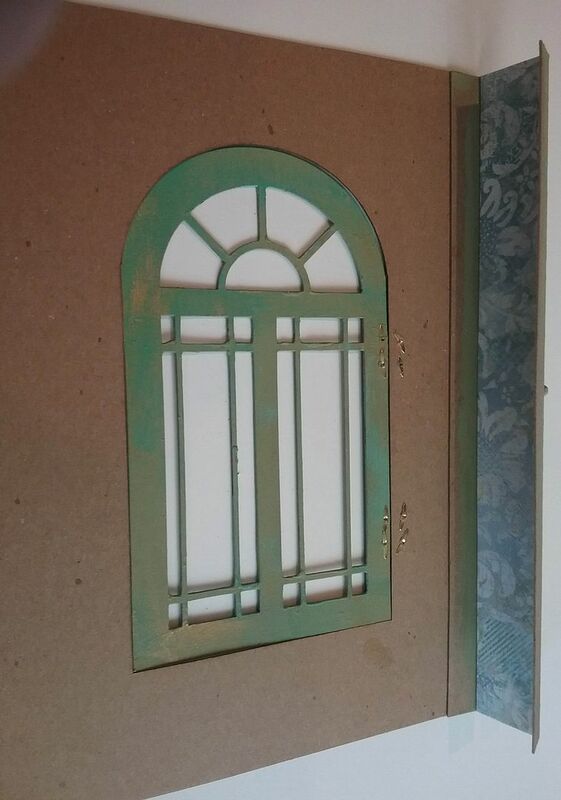 Next, I attached the painted chipboard door using small hinges and brads. I first glue the hinges in place, poke a hole for the brads and insert the brads in place. 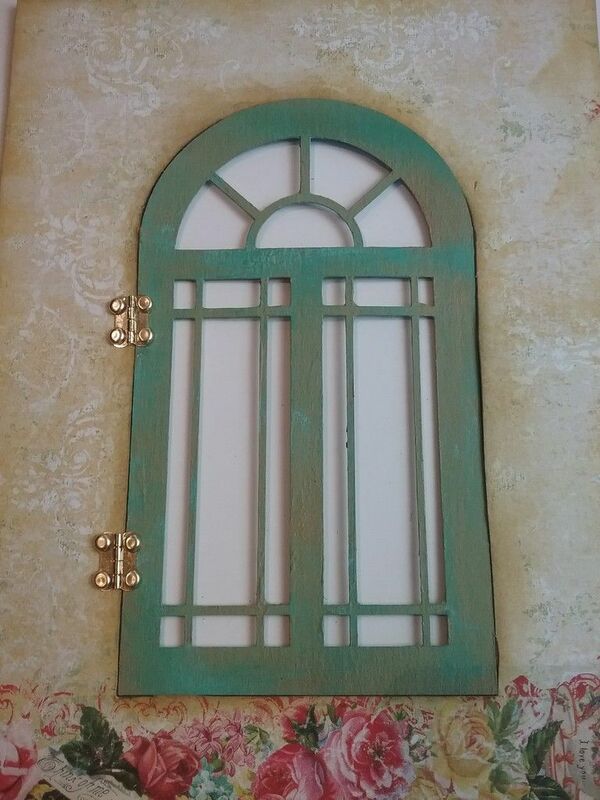 Also, note that I have painted the door in the same colors as the spine. On the backside of the first page, you can see the prongs from the door brads. 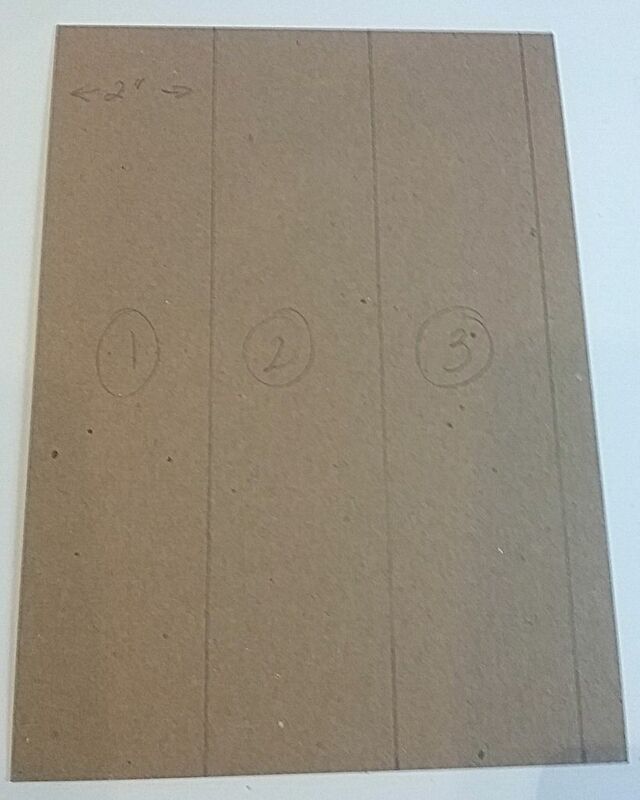 Attach the first spine to the backside of the 1st page using the tab on the spine. Next, paper the backside of the 1st page. 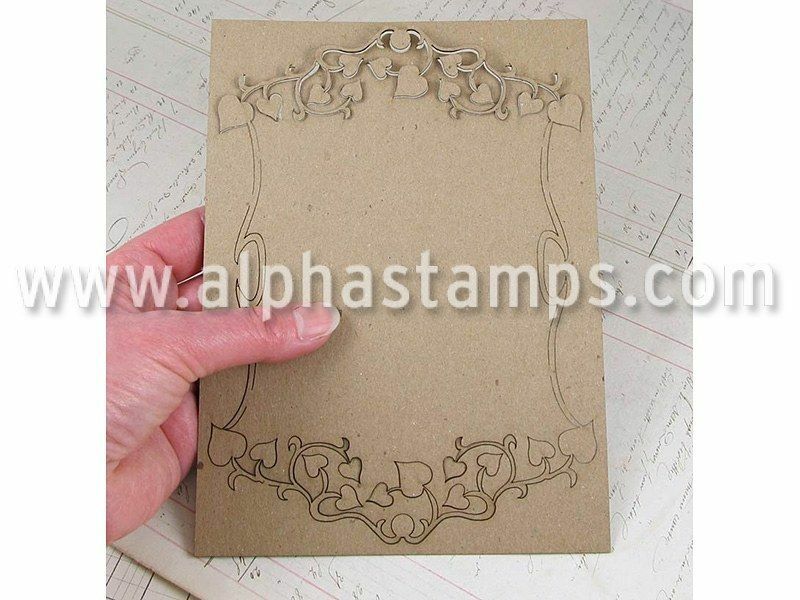 The paper will cover the prongs and the tab that was used to attach the page. Next, attach the front of the un-papered second page to the other tab on the spine piece. Now you should have the tabs on the spine piece glued to the back of the first page and the front of the second page. Now cover the front of the 2nd page with paper which hides the tab. Next, attach the second spine to the back of the second page. Cover the back of the 2nd page with paper which hides the tab. Continue in the same manner adding however many spines and pages as you like. Each spine should be attached between a set of 2 pages. Don’t put the paper on the page (with the exception of the front of the first page and the back of the last page) until the spine is attached so that you can hide the tabs with the paper. 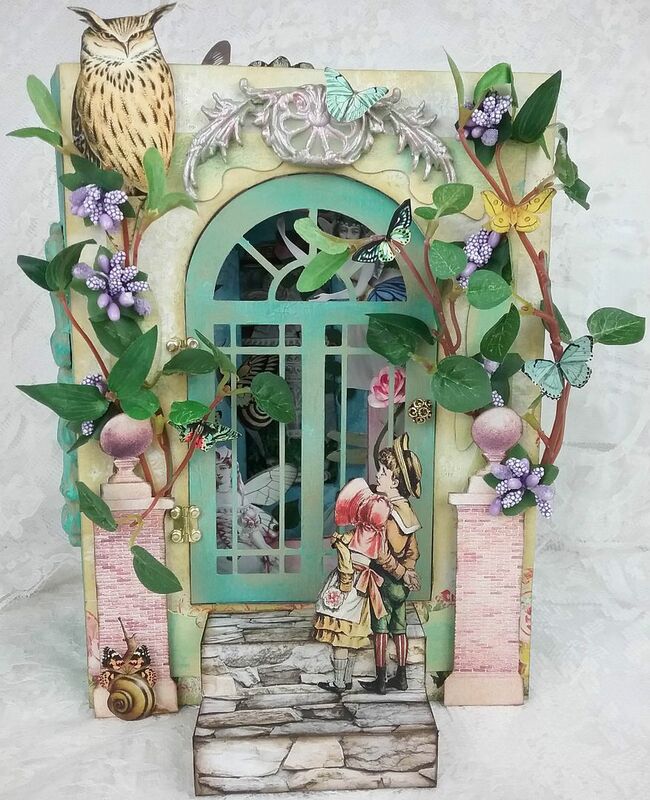 The biggest edition to the front of the book is the chipboard steps that come in a kit and are easy to assemble. The steps are covered with decorative paper. The columns are from the Garden Columns collage sheet. 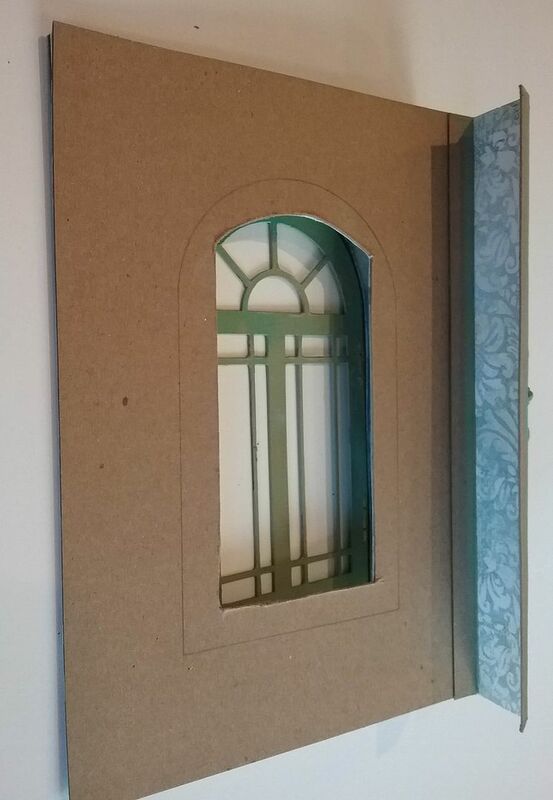 To the background I added the negative of a chipboard vine frame. I used the vine frame on another page. I added twiggy leaf garland and berries to each side. 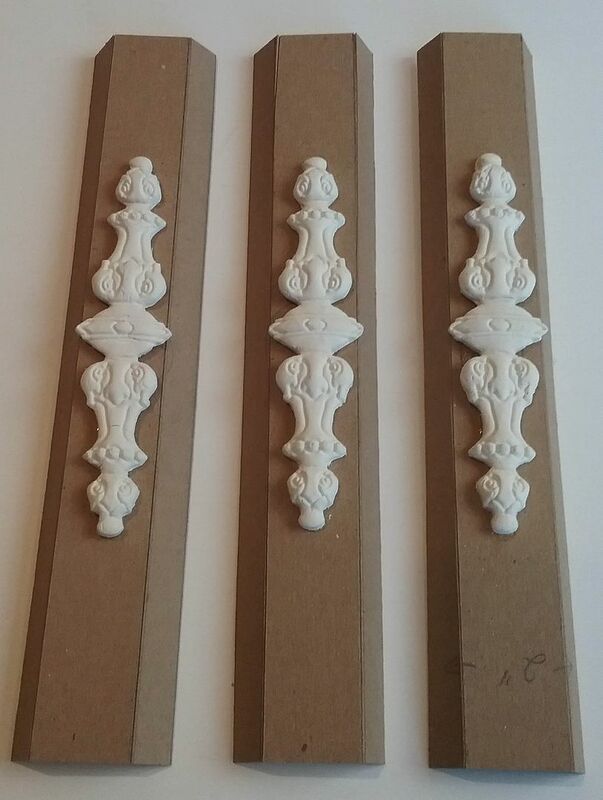 On the top is another paper clay embellishment made with the silicone mold seen below. You’ll be seeing more projects in the future using the two molds in this project and others. The owl, butterflies, and snail all come from my collage sheets. You'll find the image of the children standing on the step further down in this post. 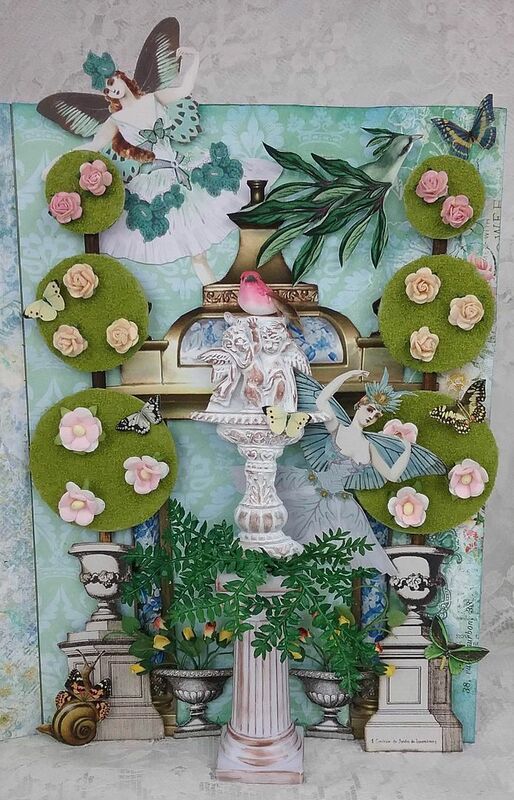 On the second page, I once again used columns from the Garden Urns collage sheet. They are popped out from the page to accommodate the rose garland wrapped around them. 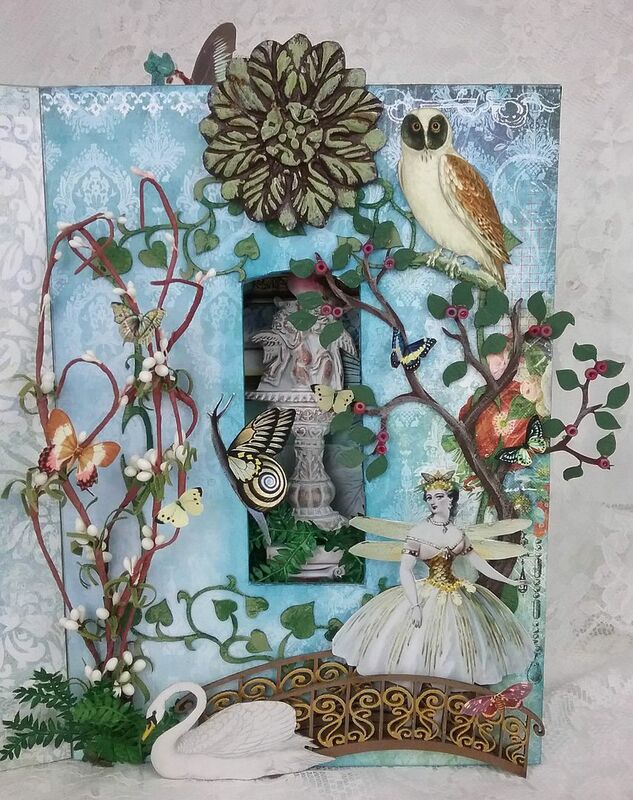 You’ll also find fairies, birds and a snail from the new Flower Fairy collage sheet. I’ve also added the rabbit from the Into the Woods collage sheet which is where all of the owls came from. 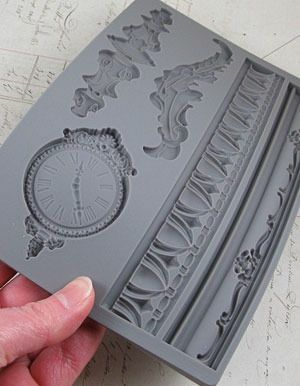 On the third page at the top is another embellishment made from the silicone mold. At the bottom is the chipboard bridge. The brown and white foliage the chipboard tree on the right is from my stash. I used beads on the tree as berries or fruit. Once again you see another fairy on the bridge. 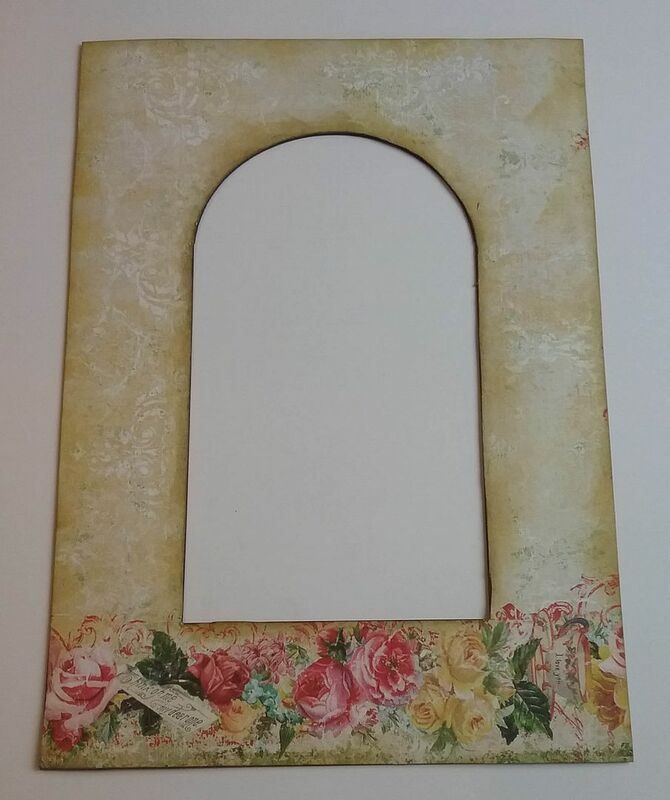 Below is the vine frame which I used on the third page and as I mentioned earlier I used the negative piece on the front. The final page is the big reveal. 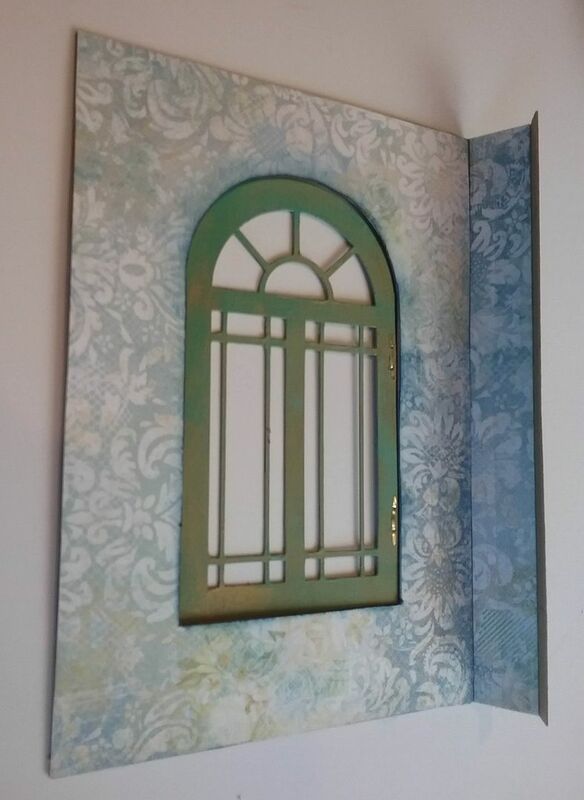 In the background, I used a frame from the Elegant Frame digital image set. To make the topiaries, I started with the Garden Urns collage sheet images, added a wooden skewer (painted brown). 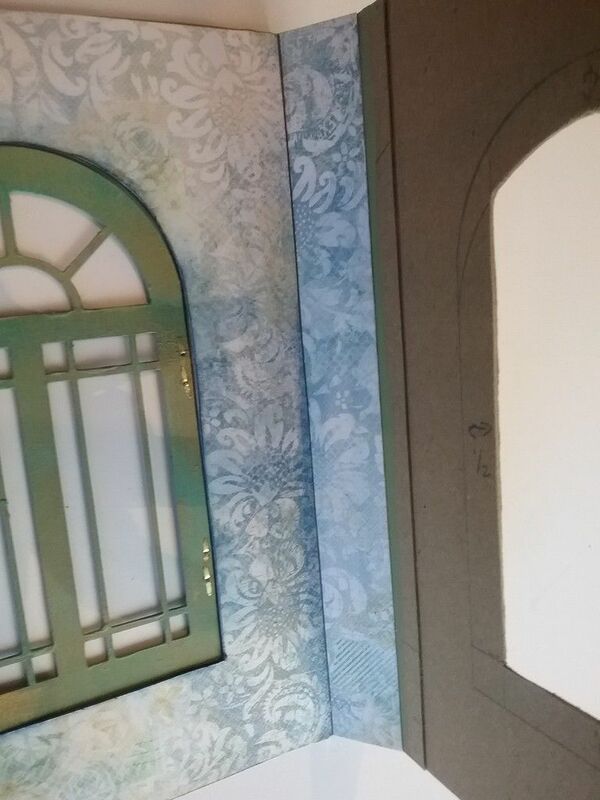 Next, I cut out 3 different sized chipboard circles and covered them with Flower Soft. The final touchs are the paper flowers. You’ll also see more urns from the collage sheet flanking each side of the column, filed with paper roses. The focal point is made from two pieces. 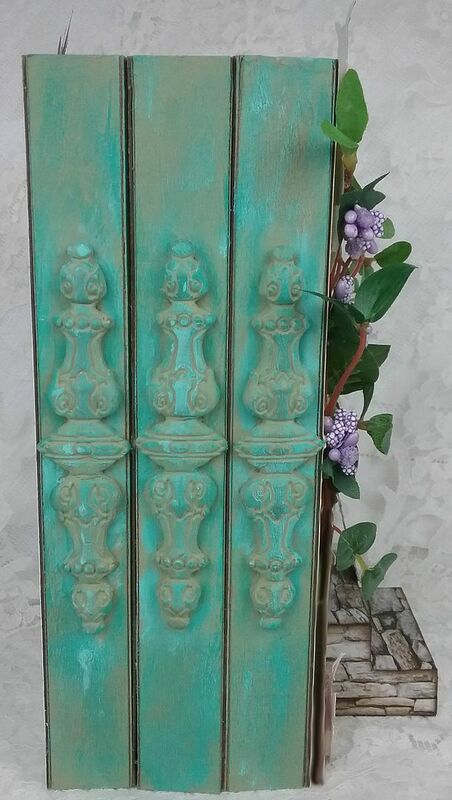 The bottom is a plastic column rubbed with Inca Gold Gilders Paste. 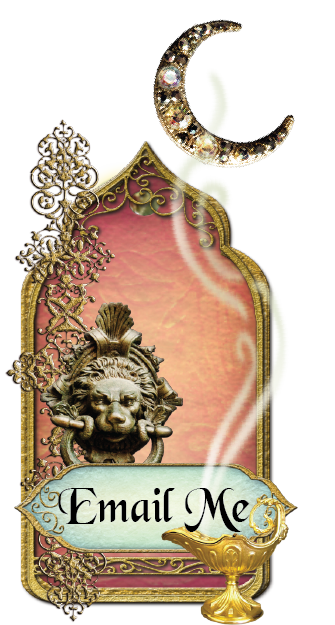 The top is a resin fountain also rubbed with Inca Gold Gilders Paste. By adding the gilders paste it made them look like they belonged together. 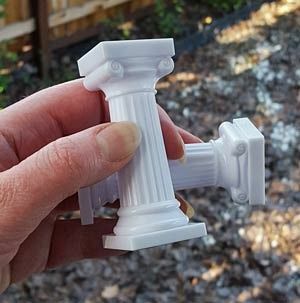 I glued the fountain onto the top of the column using E6000. At the top of the fountain is a hole that gave me a place to add ferns I cut from a piece of garland. By using the two pieces together it placed the fountain high enough that you can see it through the cutouts in the pages that come before it. 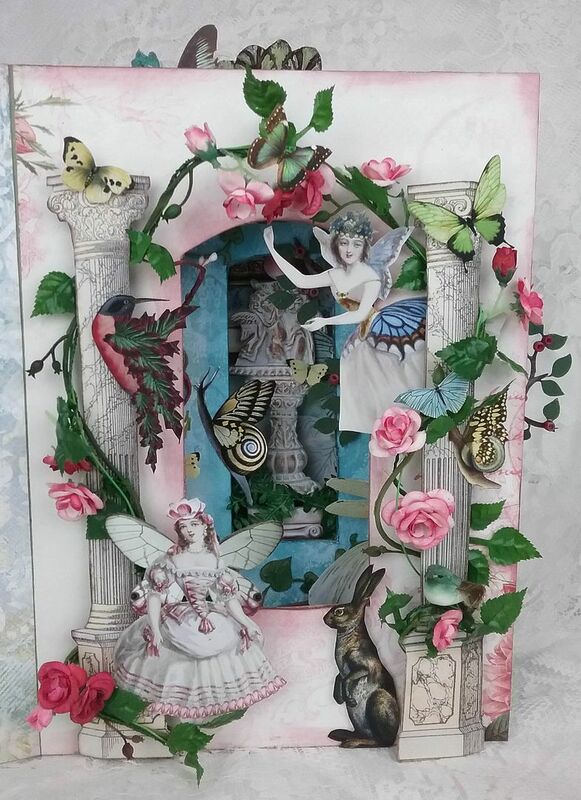 Notice more fairies and other images from the new collage sheet.